The current push to reduce North Carolina’s Constitutional income tax cap (SB75) is not rooted in sober analysis of hard economic data. From the moment that legislative leaders proposed slashing income taxes in 2013, we were promised that it would radically transform North Carolina’s economy. Now, several years into this experiment, evidence abounds that tax cuts failed to change our economic trajectory. 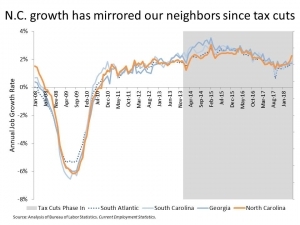 Employment growth in North Carolina has moved in virtual lockstep with our immediate neighbors through the recession and recovery, both before and after the recent wave of tax cuts started taking effect. In fact, several of our neighbor states have added jobs faster than North Carolina since the start of 2014, and none of our neighbors embarked on a similar set of income tax reductions. The economic benefits of recent tax cuts may be undetectable, but the harm is plain to see. Tax cuts have reduced state revenue by $2.6 billion each year, seriously undermining our collective commitment to strong schools, healthy communities, and a competitive economy. For example, we have an estimated $8 billion backlog in school construction and repairs statewide, we’re not aggressively building 21st-Century broadband infrastructure, and we have dramatically reduced our efforts to protect the public from harmful toxins and contaminants. Locking in recent tax cuts would become even more damaging in the next few years. The non-partisan Fiscal Research Division of the General Assembly projects that the current tax system won’t raise the revenue needed to continue current services, falling billions of dollars short in the next few years. If the income tax cap passes, it would then force legislators to cut vital public services even more, or to increase sales taxes, fees, and other levies to fill the hole. The unfortunate fact is that we have fundamental economic challenges that tax cuts simply cannot address. Poverty remains far too prevalent, wage growth remain tepid, and many communities still face barriers to opportunity. To make matters even worse, roughly one-third of North Carolina’s counties actually lost jobs over the past year, deepening longstanding racial and regional economic divides. This week, researchers revealed that North Carolina’s rural economy would expand by $5.3 billion if we ensured that everyone who wants a job can find one. We can’t realize that potential through tax cuts—we need investments in rural regions, systems that deliver the training and business supports to grow a competitive rural workforce, and 21st-Century infrastructure that connects communities from the mountains to the coast. An income tax cap won’t make North Carolina any more prosperous, or any better prepared for an uncertain future. It will simply make it harder for us to respond to the real challenges facing our state.